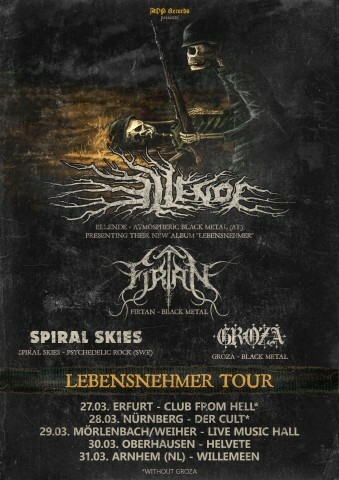 ​Spiral Skies to go on European tour in support of new EP "Cult"
Swedish occult rock quintet Spiral Skies announced the European tour dates alongside labelmates Ellende, Firtan, and Groza for this spring. Shows will be held in support of the release of the band’s new EP "Cult", which included two new songs "The Final Set" and "Cult". See also: Spiral Skies unveil video "Awakening"
EP "Cult" was released on March 1 by AOP Records and is currently available in digital formats and on 7-inch vinyl. The band’s debut album "Blues for a Dying Planet" was released in 2018 — follow the link to check out Noizr Zine’s review with a full album stream.